Beyond the physical world of running goals, PBs, running selfies et al…. lies the realm of the mind….the spiritual and mental aspects of running… Zen Running or Soul Running or Running meditation. Sakyong Mipham, author of Running with the Mind of Meditation says, “Meditation reduces chaos and stress. When we apply it to running, running becomes a tool that brings relaxation and vitality to the body. Apply its principles to your next run and run better instantly.” Interested ? Read on. Think meditation and your mind conjures up a multitude of images and words – seated position, dhyan, mindfulness, taming the monkey mind, contemplation, concentration, peace of mind…..difficult to picture running here… Are you sure ? Think of your running moments when your mind and body are delightfully aligned…of being totally in the moment and aware of your body and all around you….Is this any different from meditation in motion or zen ? Why Zen running or Running Meditation or Soul Running ? A joyful place to be – the beauty of being in the moment. A more centered, calm and peaceful demeanor with focus and clarity of purpose. Anti-depressant, anti-grief and a mood alleviator. Improved running form and efficiency – increased speed and endurance. Yes it does this too ! How ? Like everything else it requires practice. Concentration, contemplation, introspection and mindfulness are the key. Not easy to achieve throughout your run. Divide your run into three parts and try the suggested activities. Loosen up and warm-up well before you start. The Beginning – Concentration and Mindfulness. The mind and body is full of energy. Restraint is the buzzword – avoid the pitfall of too fast too soon and grace the correct running form. Focus on your breathing and your body. Look for any tensions and aches. Relax and get in the flow. 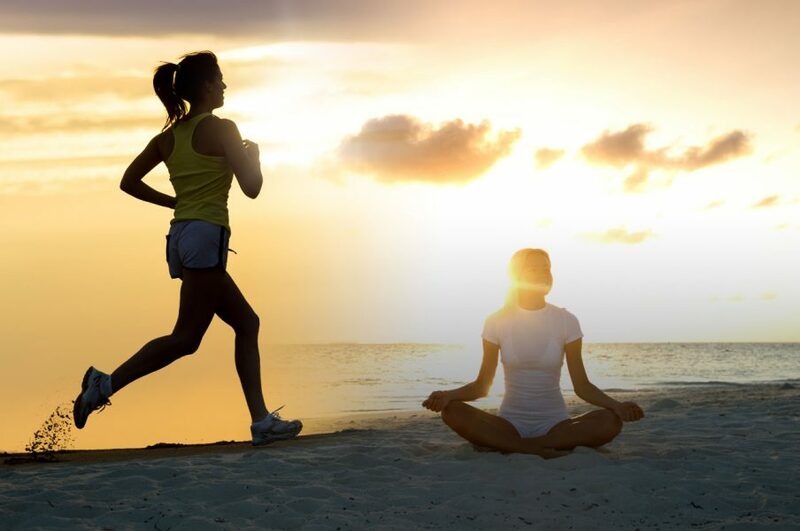 Breathe….hear the rhythm of your footsteps….achieve the effortless running form….switch to mindfulness…..become aware of your surroundings and your body…..the bliss and sheer joy of running in the moment ! The best moment of the day ! The Middle – Contemplation and Introspection. The need is to maintain the rhythm and sustain the pace. Three Jedi mind tricks ! One – contemplate your oncoming day…your to-do list. Your mind will soon be tamed…obstacles and doubts will disappear…clarity of thought, purpose and action will emerge…. Two – think about life and relationships….the simplicity, acceptance and beauty of the answers will surprise you…. Three – Ideate ! Running is the best time to get new ideas, create themes, process issues and go deep. It is a unique space of intellectual freedom where logic, intuition and creativity blend together marvelously….the mind moves when the body does. The End-Game – Accepting and Conquering the Challenge. The mind is fatigued and the body tired. Bad weather, headwinds or climbs add to the misery. The mind says Meditation and Zen be damned – just finish the run ! The need is to transcend pain and self-doubt to finish strong. Alternating between chanting a mantra and focusing on your running form works wonders. The focus on form keeps your running strong while the chanting keeps your mind away from pain and self-doubt. Pick any mantra and chant it in synchrony with your footsteps. The result – a strong finish ! When and Where. Early morning solo running on a trail is ideal for running meditation. A traffic free road or a park will also suffice. Treadmill running typically does not lend itself to Zen running. Solo running is mostly not advisable for women due to safety reasons. Find a partner who you are comfortable with and who understands that silences can be companionable too ! Running is a selfish and individual sport. Every runner is unique; there is no one-size fits all solution. There are runners who are all about speed and then there are runners who into the spiritual aspect of running. And finally there are most of us who need both the thrill of a hard-earned personal best time and the sheer bliss of running – all within the warmth and closeness of our running community! Wellthy.fit strongly recommends that you explore the limits of your running world – find your Zen ! Maybe, just maybe you might become the Running monk who sold his Ferrari ! It’s interesting to liken running to meditation. If one can indeed break it down into specific parts and focus, the rest am guessing will follow. The annant or infinity is the blissful state. The Universe dances in infinity. Doing one thing at a one given point of time is the Mantra of the Creator. We can achieve it by japa/chanting, Dhyan/meditation, devotion and surrender to the Creator/Almighty. Numerous tools have been deviced by mankind in this evolution. Running is again one of such tools. Your passion for running has made you discover this secret. This naturally comes to you effortlessly due to your pious prayer and running. I am proud of you brother. Loved and related to even single word,brilliant job – Too good bro! Thanks Keshav. I am sure an ultra runner of your caliber has already attained nirvana ! An interesting connection. Hope to achieve it and get away from the rut of speed and PBs! Thanks GS.